Now that I am making my own ketchup I keep it in the freezer as I don't use it very often. I mainly use a tablespoon or so at a time for cooking and it is easy enough to chip it out of the jar. I used up the last of it a while ago, though, and have not needed it during the summer so I decided not to make more right away. And then I decided to make Okonomiyaki over the weekend and I needed ketchup for the sauce. I had neither the time nor the inclination to make a batch so I decided to try to make just what I needed with tomato paste and spices, figuring it would be fine for mixing with mayonnaise and soy sauce. And you know what? I think I like this better than the other version. And I can whip up as much as I need whenever I need it. I used this Tomato Powder from the Spice House to make my tomato paste. 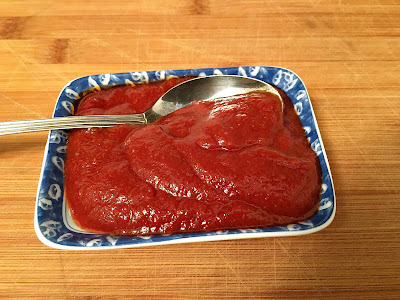 It provides for a deeper and fresher tomato flavor than the canned tomato paste, and I can make as much or as little as I need so I don't have to try to figure out what to do with the rest of the can after I have spooned out the one or two tablespoons that I usually need for a recipe. It also makes a flavorful thickener when you have a little too loose of a sauce for your sauteed vegetables. 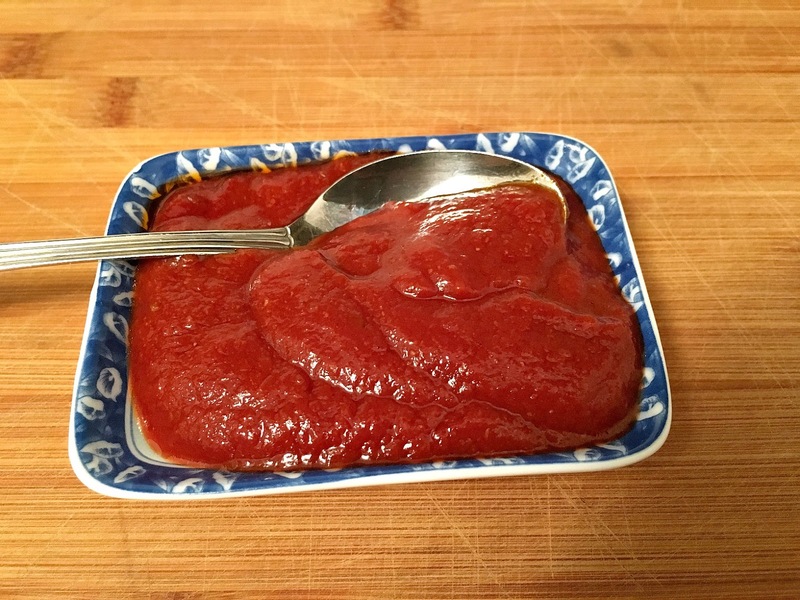 If you ever find yourself in need of a little ketchup and you just squeezed the last little bit out of the bottle, this quick fix will come to your rescue. And you might even find that you like it better than store bought. Heat oil over medium heat in small skillet. Add the tomato paste and cook, stirring, for a minute. Add the water and blend well. Add the spices, brown sugar, and vinegar and mix well. Lower the heat and let the mixture simmer until thickened, about 10 minutes, adding water as necessary.